Organizer Chelsea Higgs Wise called for Governor Ralph Northam to resign at a community dialogue on Sunday. At a community dialogue on Sunday in Richomond, activists and residents renewed calls for Governor Ralph Northam to step down after he announced his intention to go on a so-called “reconciliation tour” across the state. They gathered at Devil’s Half Acre, the site of an old slave trading complex less than a mile from the Governor’s mansion. 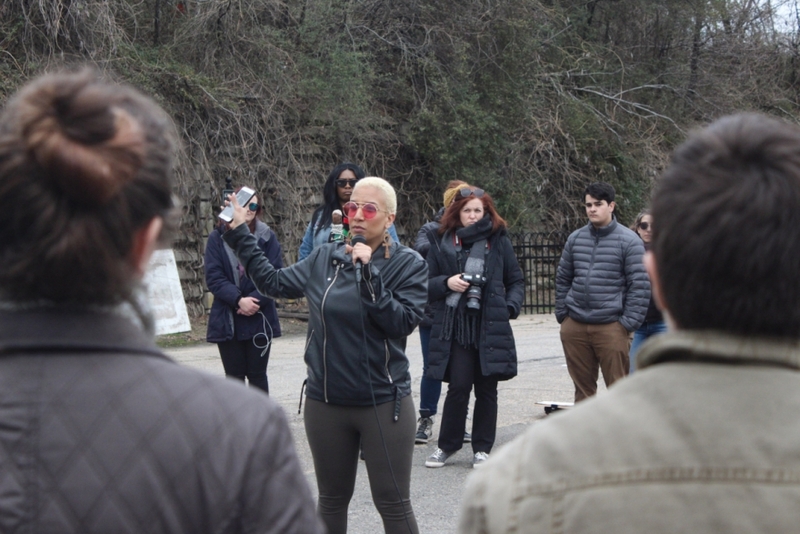 A number of organizers recalled the roots of the current scandal in the long history of slavery and racism in the former capitol of the Confederacy. And, they tried to make sense of the week that saw Northam and Attorney General Mark Herring both admit to appearing in black face in the 1980's. On Sunday morning, Northam appeared on CBS where he told reporter Gayle King that he wanted to devote the remaining years of his term to pursuing racial equity and reconciliation. Community organizer Chelsea Higgs Wise, who says she campaigned for Northam in 2017, remains skeptical. She said she only heard Northam mention African Americans twice throughout his entire campaign. “Every black event that he went to, I went to," she said. "He only said it twice, for months. He’s never been able to talk about blackness." Higgs Wise also criticized Northam's use of the term "indentured servitude" in his interview with King to discribe the African slaves brought to Virginis 400 years ago this year. Activists also grappled with the recent accusations of sexual assault against Lt. Governor Justin Fairfax. Dr. Vanessa Tyson, an associate professor at Scripps College in California, released a statement Wednesday accusing Fairfax of sexually assaulting her at the 2004 Democratic National Convention. Just two days later, Meredith Watson said she was raped by Fairfax when the two were classmates at Duke University in 2000. He has since faced mounting calls to step down, and Democratic Delegate Patrick Hope has threatened to introduce articles of impeachment on Monday. Ravi Perry, an activist and professor of politics at VCU, said Fairfax could be forced to resign, but he would be upset if Herring and Northam didn't follow suit. "As a black man, if the white racists stay and the black man goes, I'm going to have a problem with that," he said. Attendees were encouraged to write down their ideas on how Virginia could move toward racial equity. They included the removal of confederate monuments and the ratification of the Equal Rights Amendment.